The ER15 valve head seems to have been introduced after Watkins' transformation into Wem was complete, in 1964 or possibly 1965. 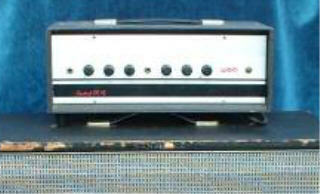 Although seemingly the same head as that of the earlier Pick-A-Back & Pick-A-Bass models, it was styled differently and sold separately, not tied to any particular speaker cab. It also gained an extra watt, probably more due to the marketing department than to any technical changes ! Two channels, each with 1 input and bass, treble & volume controls. Usually labelled "Control ER15 : Controlled Power Amplifier". It stayed in the catalogue for several years, but was eventually superseded by larger heads.